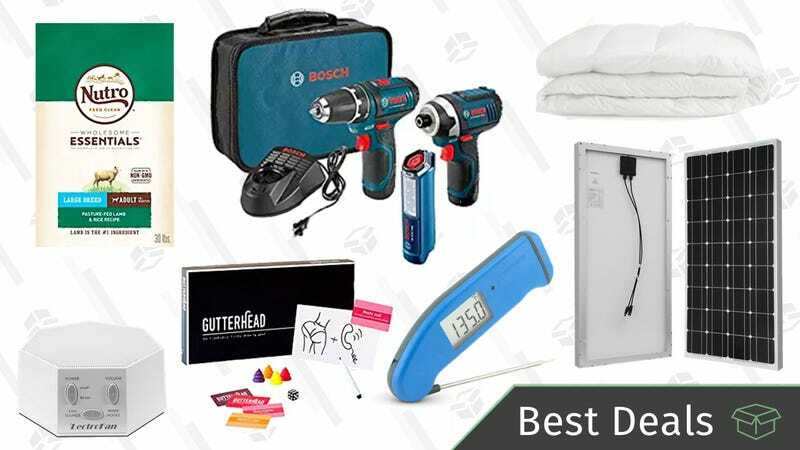 A Bosch tool set, Nutro pet food, Casper’s Memorial Day sale, and more kick off the best deals of the day. Mac users get the short shrift when it comes to mechanical keyboards. Sure, any keyboard you plug into a Mac will technically work, but we didn’t pay good money for an Apple computer just to have to use the wrong key layout. Das’s Model S is one of the few Mac-specific mechanical keyboards out there, and Amazon has it marked down to an all-time low $99 right now. I’ve used this keyboard, and be warned, its Cherry MX Blue key switches are as loud as they are satisfying to type on. And oh yes, they are satisfying. But just make sure your coworkers won’t come to resent the noise. Samsung’s adorably tiny portable SSDs leave flash drives and external hard drives in the dust, and the 500GB model is cheaper than ever today. It’s still a lot more expensive than a portable hard drive, but in addition to the speed and size advantages, it should be more durable as well, due to a lack of moving parts. It’s the sturdiness of a grocery basket with the collapsible sides of a tote bag. This CleverMade bag holds up to 25 pounds of stuff, and the flat bottom will stop your laundry detergent from smashing down your loaf of bread. It typically sells for about $16, but this charcoal/cream bag will set you back just $13 today. You can add a closet to any room with this AmazonBasics freestanding rack. It has five shelves, which hold 15 pounds each, and two garment rods. Today’s $22 price tag is the lowest we’ve ever seen, so if you’re in need of a little extra storage space, today is a good day to buy. Sear in some savings on these discounted grills and smokers from today’s Home Depot sale. Everything from the popular Big Green Egg-like Kamado grills, to propane and electric smokers, to several propane grills are up to 20% off. This sale will only last until the end of the day or until the cookers sell out, so don’t get burned by missing it. Plus, if a dad in your life might enjoy one of these, Father’s Day is a little over three weeks away. If you’ve had your heart set on a sous vide cooker, but don’t want to shell out $120+ for the top-rated Anova, you can get this My Sous Vide machine for just $59 on Woot today. This cooker doesn’t have any bluetooth capabilities like its pricier competitors, but it does have a timer and can heat to up 210 degrees within a 0.1 degree accuracy. Simplehuman makes our readers’ favorite trash cans, and one of their most popular kitchen models has a rare $20 discount today. This has been my personal kitchen trash can for several years now, and I love the thing more than anyone should be allowed to love a garbage receptacle. It looks great, the pedal mechanism is rock solid, is does a good job of containing, odor, and the inner lining makes it easy to remove a bag and add a new one.. It sounds like an expensive proposition, but today, Amazon’s selling this well-reviewed FoodSaver FM2435 starter kit for $84. Unlike lower end FoodSavers, the 2435 includes a retractable vacuum sealing hose, allowing it to vacuum seal specially designed zipper bags, in addition to the usual heat-seal bags. Hang up these trendy Edison bulb string lights in your backyard and make Pinterest proud. This 50-foot strand is completely weatherproof, so you can leave them up year-round. They normally sell for $51, but today you can light your space with them for $44. As far as snacks go, raw almonds are about as healthy as they come, and you can get 48 ounces of them from Amazon’s Happy Belly brand for an all-time low $18 today, if you’re a Prime member. $60 is a terrific price for a hammock with an included steel stand. But a built-in cupholder? Come on. Who can resist that? Just be sure to use promo code DOUBLEHAMMOCK5. If you’re tired of normal bath towels taking up a ton of space in your camping backpack, these lightweight PackTowls might be a good alternative. They’re made of microfiber, so they’re super absorbent without the bulk. Plus, they’re thought to dry 70% faster than traditional towels. Today, these normally-$25 towels are down to $17 in most colors, which is just a $1 away from their all-time-low price. These would also be great to bring to gym, so you don’t have to deal with packing a soaking wet towel back into your gym bag. No Blu-ray collection is complete without at least a few of Hayao Miyazaki films, and a handful of Studio Ghibli’s best are available for just $13 each today. All four films are 2017 re-releases from GKIDS, which took over Studio Ghibli’s U.S. distribution rights from Disney, but the content and English dubs should be the same as the Disney discs.